← HIGHLY RECOMMENDED: Kendall-Jackson Vintner’s Reserve “Summation,” White Wine Blend (33% Sauvignon Blanc, 27% Viognier, 15% Chardonnay, 9% Semillon, 6% Roussanne, 6% Pinot Blanc, 2% White Riesling, 2% Muscat Canelli), California, 2009. 13.5% ABV. $11.99, available for $9.99. 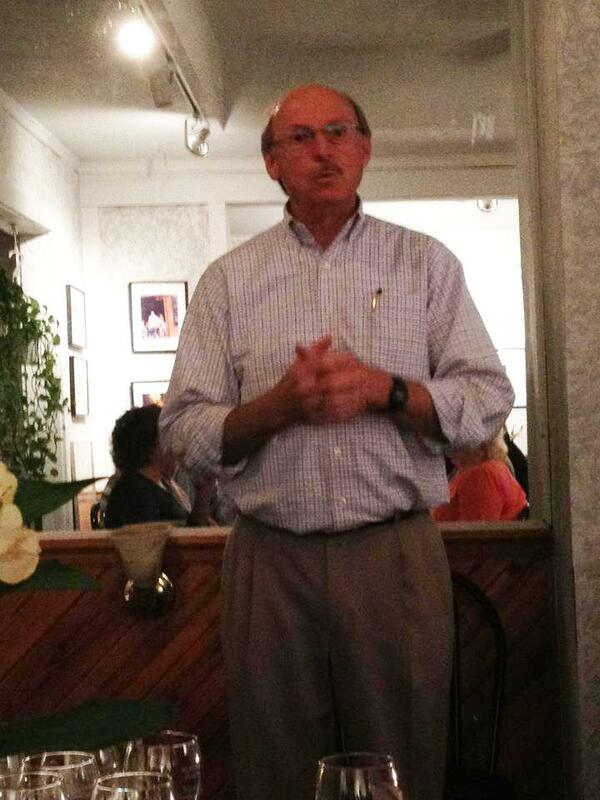 WONDERFUL: An evening of wine tasting: Bell Wine Cellars, with Anthony Bell presenting. At Wine & Cheese Gallery, Gainesville, FL. On November 15, we experienced a wonderful wine tasting featuring six wines from Bell Wine Cellars in Yountville, Napa Valley, presented by the winemaker himself. Anthony Bell presented a fun and informative evening, offering us a “sense of place” indeed where his wines are concerned. Bell’s approach is to work as naturally as the wines will allow. He told us specifically that he produces his lovely Cabernet Sauvignon Clone 6 without fining and filtering, and the intense, refreshing, and wildly inexpensive Pinot Gris without oak or even malolactic fermentation. He produces his artisan wines with great care: “Every barrel is touched by me,” he said, and each wine label is numbered, like a fine artist’s print edition. The 2007 Claret we took home was 21,235 of 23,342. Labels also show the date of bottling, method of aging (barrel composition and percentages), and the acid and pH both at harvest and at bottling. Bell is perhaps most proud of Clone 6. In 1980, while working at Beaulieu Vineyards, he conducted research with Austin Goheen on clonal variation in grapevines, specifically related to which Cabernet selection(s) Beaulieu should plant as it prepared for its second century of operations. Long story short: Clone 6 “was plucked from an abandoned experimental station at Jackson, Amador County, California, located in the northern Sacramento River Valley. Goheen used an old parcel map from the Davis archives to track down the agricultural field station, formally closed in 1903, where he found the vines, overgrown and wild. 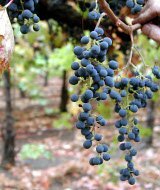 He brought back several vine cuttings, including one thought to have been originally imported from Bordeaux by either the Masson or Wente families in the 1880s.” This is now known as as UC-Davis Clone 06/Jackson. The grapes, sparse to say the least, don’t look like much. In fact, Bell’s wife, Gloria, calls them “Charlie Brown’s Christmas tree.” However, they produce a big, rich, elegant Cabernet that is beautiful indeed. Bell grew up in Stellenbosch, South Africa, playing in his father’s vineyards. At age 17, he landed wine-related work in Spain, and visited Bordeaux around the same time. He earned his degree in viticulture from Stellenbosch University, and his enology degree from UC-Davis. He worked for 15 years at Beaulieu as VP, GM and Director of Winemaking before starting his own winery, Bell Wine Cellars, in 1991. 2010 Pinot Gris, Williamette, Oregon, $15/suggested retail. Highly aromatic with fruit and stone, rich creamy mouthfeel, fruity and tart, a little sweet and very refreshing, lovely finish. Would buy this in a heartbeat (and did). RECOMMENDED. 2009 Pinot Noir, Williamette, Oregon, $24/suggested retail, available for as little as $16.99. Made from the Pommard clone. Delicate. Strawberries. Soft, yet slightly spicy on the finish. Changed with cheeses—cherry! 2007 Syrah, Canterbury vineyard, Sierra Foothills. $24/suggested retail, available for as little as $16.99. This was the third wine I sniffed and tasted, and at the first whiff I jumped back and said “Wow.” This is Bell’s best-selling wine, and led to one of Bell’s life-lessons and winemaking lessons: “Don’t follow the business plan, listen to the vineyards.” This wine is fabulous: round, rich and strong, and beautifully balanced, yet not hot and spicy. HIGHLY RECOMMENDED. 2007 Claret, consisting of four types of Cabernet (79% total), 11% Syrah (same as what we tasted), 4% Petite Verdot, 3% Cabernet Franc, 2% Malbec, 1% Merlot. Fruit at front, tannin at back. Bell calls this Claret rather than Meritage largely because of his love of history and his winemaking in the Bordeaux style. Lovely; $29/suggested retail. 2007 Cabernet Sauvignon, Napa, $39. A blend similar to the Claret sans the Syrah; a little more of the Cabernet “bite.” Lovely; $39/suggested retail. 2007 100% Cabernet Sauvignon Clone 6, Rutherford. Earthy, black olive, fruity and lovely. Lovely; hard to find for less than $60. This entry was posted in Cabernet Sauvignon, California, Oregon, Pinot Grigio (Pinot Gris), Pinot Noir, Red Blend, Syrah/Shiraz, Tastings. Bookmark the permalink.